For phys. ed. I'm taking volleyball. I was in the volleyball club before, so I'm pretty good at this sport. When I don't have a class after phys. ed. I throw myself completely into the game, working up a real sweat, and then shower down afterwards. If I am so unfortunate as to have a class right after, there's no time to shower, so I play it cool and try not to work up much of a sweat. Still, I just love the exercise so I can't help letting go now and then. The first time I tried volleyball was in first year of high school. 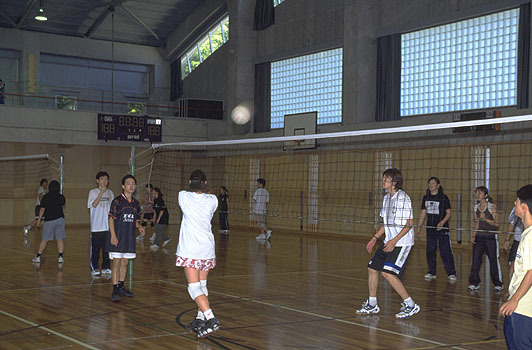 Volleyball is played on a small court, with a team of six. Since you have to collaborate with all your teammates both the same and different positions, there is a lot to think about, but I think it is a sport in which you quickly reduce the distance between yourself and your teammates. When I was playing volleyball in club, I found out what it is like to have a slump and I experienced the competition to win a particular position. Since I'm studying for entrance exams, I can't join a club. I wish I could play volleyball as a club activity, even though I know the frustrations and the pressures you have to put up with.